Note that I’ve only tested this with SharePoint 2013. You may need administrator rights to your website, as well as you should know how to work with custom lists and document libraries and such. After you have downloaded the files, open the “sp-bootstrap-list-viewer.html” in you text editor. This is where you will add the plugin information. Then, you add 2 things: the list name, the “Answer” column. The rest of the options are optional such as the “filterBy” and “rowLimit”. The table below will show you want the rest of the options do. Once you have edited the html file, upload it to a location in your SharePoint site, typically a document library. You will need to copy the location of the file. Let’s go ahead and add a CEWP into your SharePoint page. 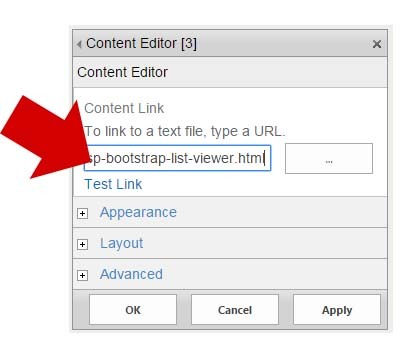 in the “Content Link” input, add the location of the html file you’ve just uploaded. One thing to remember. If you plan to use the plugin multiple times in a page, you need to change the “instance” value to a random number prefixed with alphanumeric characters. You also need to make this the “Object” name of your html (where it says var spBL233565656 = new spBootstrapList …). This will make the instances of your plugin unique in every page and will not clash with each other. For those of you who want to know more about how the plugin works, I will show you some of it’s main functionality. Note that this was originally built for a FAQ list for SharePoint, hence the FAQ names such as “Question” and “Answer”. Though the plugin will work with any kind of SP list. We will need some help with Mark Anderson’s SPServices – a jQuery plugin that basically does the web service calls for us. This allows us to work with the lists’ data and convert it to our desired markup. Of course we will need Bootstrap – which will take care of the responsive and overall styles, as well as jQuery for DOM manipulation. Continuing with our process, note that we need the “_faq” array to be filled for our next method to fire. This method is called methods.buildFaqs(), So we built another object called “methods” and inside this is a series of functions. This will be our “internal” methods. So you see, we have our SharePoint list data in our array, and we build the HTML from it. Our pagination logic is quite interesting. 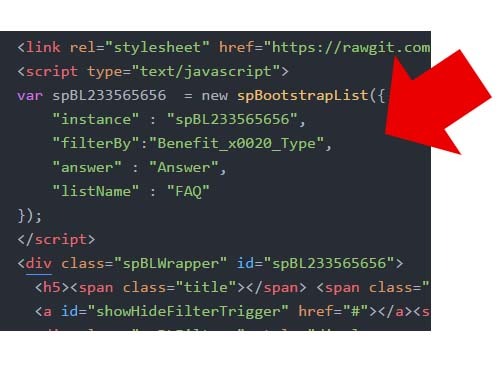 We use the Bootstrap pagination HTML, and for each page, we need to do a AJAX call in order to get the next page ID. This is how SharePoint determines where to offset the record when a query is made by using “ListItemCollectionPositionNext” as a parameter. You noticed too from the code above that we use SPServices on each click. That’s because we are only grabbing a predefined set of records – which is the limit that we pass into our plugin. So the plugin supports filtering. This means that you can choose a field from your list and make that a “filter” column. A lot going on here. You see that we make a new AJAX call through SPServices, passing our filter value. We parse the response, rebuild our items through “methods.buildFaqs()” and rebuild our pagination through buildPagination(). There’s much more logic in the plugin such as the creating the CAML queries – but I decided not to go through them. If you’re well versed with .NET and SharePoint – you will be able to decipher these easy. Once you have the code in place – save and refresh your page. If by any reason some of the options are passed incorrectly, error handling is added and will be displayed in the HTML. You also need to turn on the console for more messages of what’s going on. I’ve added a couple of helpers that will get you information about your list such as getAllColumns(). This will display all of the fields that belong to the list you’re working with. Simply use the instance name + getAllColumns(). As you can see, we can make SharePoint internal lists work responsively. We may have to redo the markup entirely – but there are web services in place to grab the data. Thanks to open source code such as SPServices, jQuery and Bootstrap – our task becomes somewhat easier. That’s a top class solution Michael. Well done! Bootstrap was messing my page a bit so I had to use bootstrap-iso from Chris Youderian. Thanks so much for this elegant solution. Is there a way to add more column info besides the Answer? For example, another column with a person’s name related to the question. Am I just updating the CAML query? Is there any JS you got stored that will allow me to use 2 levels of accordions? – Is there a way to order by another column? – Ist there a way to show the categories by default (expand by default)? Would be very happy about a short reply! Is there a way to order by another column? – I don’t think that’s supported at the moment. a way to show the categories by default (expand by default)? – I don’t think that’s supported at the moment. These are great suggestions – and I can definitely add it soon. When getting the same error as i got with the Answer art but with categories. I have checked so the interanal name is the same, and it is correct ut still no success. Do the columns need to be in a specific order? I have checked the code when posting a new post. It says internal is Category. I tried sorting by Category in the list. Then checking the URL as another page suggested. Still Category. I stand clueless on what to do. I think something is broken. This is using just the html, the rest is default. css and JS are on your hosting. Webpart is not sized. It is glyphicons that are Messing with me. IT is non existing in bootstrap. I think that issue was raised before. The glyphicons location is not in the CDN. Let me think of ways to go around this. The pagination gets damaged somehow. Do you have an example where this is live? Because the code looks good, and when i inspect it it looks fine. The glyphicons an paging styles should be good now – it’s the link to bootstrap. I was linking to the wrong file. No it doesn’t have to be in any specific order. That is odd – if you have the internal name right. Nice work, cant get it to work tho. I have uploaded the css/js/html localy and linked them in html file. The list name is Accordion and enterd in the file. I first had the files in “Site assets” and moved them to Pages dir with no result. I would do a console log on your object. This is the variable you assigned the “new” keyword to. See what the listName is. So it tells me that my field name is Answer but it is still not working. README does not specific any typ of order that is requierd. This is very cool. I was trying this solution but I have an error in console Exiting buildPagination(). I did try adding the getAllColumns as well and when I added its showing as Unrecognized Expression. Please let me know whatI’m doing wrong? Try working your way up and do a console.log. Make sure all the required values are in. Hi Michael. What if the FilterBy column (Category) is a Lookup value? The Category displayes as: “4;#WhateverYouSetAsCategory” … would you know how to get around this easily? Thx for Shareing. Nice feature! Is there a way to filter multiple columns? Yes filtering multiple columns will have to be done by updating your CAML query. What if I want to filter using multiple multiple columns? Were you able to figure out how to fix those bottom previous/next buttons? I was wondering if you have away to render images. For me the “answer”, when using an SP Picture column type, only renders the URL and not the image. I believe the picture column type returns a string with two values separated by a delimiter. You can do a .split() and get the value you need. Interesting, learned a lot from this example – thank you! Curious though – in Edge it won’t render at all, however in Chrome or Firefox all is good. Also, not sure why my bottom previous/1-2-3/next appear as bullets instead of the clean formatted in your example above. You need to add some custom CSS to the file to get them to display in-line. With regards to order, how do you specify which filter by value goes first? I believe the filter values do not have a sort order. So it actually takes the order of which record goes first. Meaning, which list item has the specific filter value entered, will go first. I can add a default sort by alpha in the next version. This seems to work perfect thanks! The only issue I seem to have is when I try to filter by a certain field. I change the FilterBy value in the html file, and reload, I get a message saying ” checking for pages… which just wont load. Any idea where I could be going wrong? It’s most likely that SP has assigned an internal name that is different than what you are adding in the html file. There is a helper function that you can run -> spBL233565656.getAllColumns() – simply replace the “spBL233565656” with your instance id and you should see a list of columns from that list. Look for your column and use that as the filterby. Thank you so much! Worked like a charm. First, this is an excellent solution with many good helpers included. Thank you for sharing! I did have one question that is puzzling me. I have a list with many items but only wanted to display those items that are approved to be displayed. I found the query function works great for the filters because the numbers shown when you ShowCategories is correct. However when buildfaqs function executes it will still display all items even if the approved column = false. I tried to add the viewName option for SPservices but that still is not working as expected. Do you have any ideas? Thanks again. Now in the console, search for that column that is giving you problems, see if the internal name matches your query. Where does the the “Answer” column come from? the answer column is a list column. I had originally built this for a Question and Answer list. Curious as to how the Question/Answer plays out in a different Sharepoint Library – have a document library and trying to use this and I can’t seem to win with the Answer field. Add a custom column and call it “Answer” for now? Also, make sure it’s named “Answer” as the internal name. SP creates an internal name for the columns. Not sure I’m following you still. Sorry couldn’t reply to your response, wouldn’t let me. I have a Sharepoint Library, it seems to find the Library of documents. It seems to find library as when I put a random name in the name field it returns and error and when I have the correct name, it doesn’t return an error. In that library I have Name, Topic, Types, etc.. fields. I added an Answer field/column but not I understand how that helps. I tried “answer”: “Answer” or “” (blank) and it returns invalid field name for Answer: Answer. How would I get it to pull all documents within that particular library? I’m trying to understand the relationship between this method and using JSLink or if they are unrelated / can be combined. I’ve seen that listed as the optimal way to change the rendering of list views. What are your thoughts?